For the 5th straight year, Accolo is recognized as a leading Recruitment Process Outsourcing (RPO) provider. HRO Today’s award proves Accolo’s ability to take on any hiring challenge and deliver the goods. HRO Today magazine recently announced the results of their annual “Baker’s Dozen” Recruitment Process Outsourcing (RPO) provider ranking. Each year, the magazine ranks the leaders of the RPO industry by the criteria of service breadth, deal size and overall quality. Accolo was recognized as an RPO leader for the fifth straight year and was specifically recognized in the 2012 Baker’s Dozen Mid Market Leaders category, including for Breadth of Services. HRO Today’s Baker’s Dozen is a data driven ranking system based on online surveys taken by clients of RPOs on the specifics of the work that those RPOs have done as well as their satisfaction with that work. Once all of the survey scores are collected, the data is algorithmically scored and the year’s winners are ranked. The 2012 Mid Market Leaders recognized Accolo as 2nd place in the Breadth of Services category and 4th place overall in this year’s Baker’s Dozen. Over the last 5 years, Accolo has made the “Project/On Demand Leaders” category of the internationally prestigious list five times, including being voted 1st place twice. “This is fantastic news,” said John Younger, President and CEO of Accolo Inc. “It is truly an honor to be recognized for all of our hard work. I’m especially proud of our placing in the Baker’s Dozen for the fifth straight year, because hiring manager satisfaction is such a large focus for our entire company. Our achievement in this year’s ranking would not be possible without the impact that our hires have had on our customers, and in this way, their success is ours as well as we continue the relentless pursuit to reduce the friction in connecting the hiring manager and best fit candidates”. 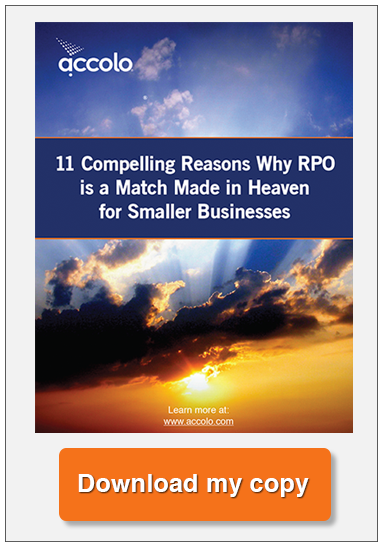 Accolo is the leading Elevated RPO Solution provider. Unlike any other hiring option, Accolo’s bold approach combines a patented SaaS Elevated RPO platform with embedded social network job marketing, a Hiring Intelligence Knowledgebase™ and best-practice based workflow. 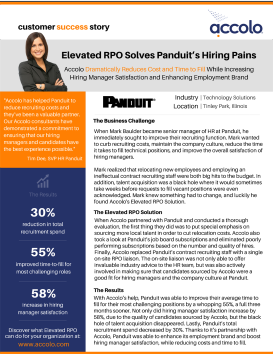 Companies use Accolo’s Elevated RPO solutions to materially Increase the productivity of their internal recruiting process, while being able to scale recruiting capacity on-demand. Many leverage Accolo as their turn-key internal recruiting department. Accolo is acknowledged as the leading Elevated RPO provider and is a founding member of the Recruitment Process Outsourcing Association.